Relation to Tosafot of Talmud. Most prominent of French tosafists; born at Ramerupt, on the Seine, in 1100; died at Troyes June 9, 1171. His mother, Jochebed, was a daughter of Rashi. Rabbenu Tam received his education from his father, from Joseph Ṭob 'Elem (Bonfils) II., and from his eldest brother, Samuel ben Meïr (RaSHBaM). After his father's death Jacob conducted a Talmudic academy in Ramerupt. On May 8, 1147, on the second day of the Feast of Weeks, French crusaders broke into his home, robbed him of everything except his books, dragged him into a field, insulted him on account of his religion, and decided to kill him. They inflicted five wounds upon his head, in order, as they said, to take revenge upon the most prominent man in Israel for the five blows which the Jews had dealt to Jesus. At that moment a prince of high rank happened to pass, and Jacob called upon him for protection, promising him a horse worth five marks in return. The prince thereupon bade the crusaders give the rabbi into his keeping, promising that he would either persuade him to be baptized or place him in their power again on the following day (Ephraim bar Jacob, in Neubauer and Stern, "Hebr. Berichte über die Judenverfolgungen Während der Kreuzzüge," p. 64). Shortly afterward, Jacob went to Troyes, not far away. It was probably there that the first French assembly of rabbis took place in 1160, in the deliberations of which Jacob (R. Tam) and his brother took a prominent part. Among other things, it was decreed in this assembly under penalty of excommunication that disputes between Jews must be settled in a Jewish and not in a Christian court (Neubauer, in "R. E. J." xvii. 66 et seq. ; Jacobs, "The Jews of Angevin England," p. 47). A second synod in Troyes, held after RaSHBaM's death, renewed an old law of Narbonne which decreed that if a woman died childless within the first year after her marriage her husband, after deducting the equivalent of what she had used during the year, was to return her dowry and valuables to her parents or guardians (see "Sefer ha-Yashar," § 579; "R. E. J." xvii. 71-72). This regulation and that of the first synod (see Kol Bo, § 117) are by some authorities (Meïr Rothenburg, Responsa, No. 934, ed. Prague; No. 159, ed. Cremona; Harleian MSS., London, No. 5686) designated "ordinances ["taḳḳanot"] of R. Tam." A third synod, presided over by R. Tam and Moses of Pontoise, threatened with excommunication any person who should question the legality of a deed of divorce on the ground that the document had not been written in the prescribed way. Other ordinances, doubtless passed at similar synods (see Synods, Rabbinical) by R. Tam in conjunction with other French rabbis, were cited in the name of R. Tam alone, and correctly, in so far as they were due to his suggestion. Among them was the repetition of the ban uttered by R. Gershom against polygamy, and the regulation that men must not divorce or desert their wives except for sufficient cause; according to Halberstam MS. No. 45, p. 256 (now in Montefiore Library, No. 130; comp. H. Hirschfeld in "J. Q. R." xiv. 195), in which this second regulation is cited in the name of R. Tam, only the exigencies of business or study are sufficient to justify a man in leaving his wife at any time. It is said that R. Tam was very wealthy, and had official relations with the King of France ("Sefer ha-Yashar," § 595), who favored him (Abraham ben Solomon, in Neubauer, "M. J. C." i. 102; Harkavy, "Ḥadashim gam Yeshanim," supplement to the Hebrew edition of Graetz, "Hist." vi. 6, note 10; Heilprin, "Seder ha-Dorot," i. 208a). So far as is known, Jacob had two sons, Joseph and Solomon, and one daughter, who married in Ramerupt. The "Isaac ben Meïr" mentioned in the "Sefer ha-Yashar" (§§ 99, 252, 604) was his brother. When the news of the heroic death of the martyrs at Blois reached Jacob, he appointed Siwan 20 (in the year 1171 it was May 26) a day of fasting for the inhabitants of France, England, and of the Rhine provinces. 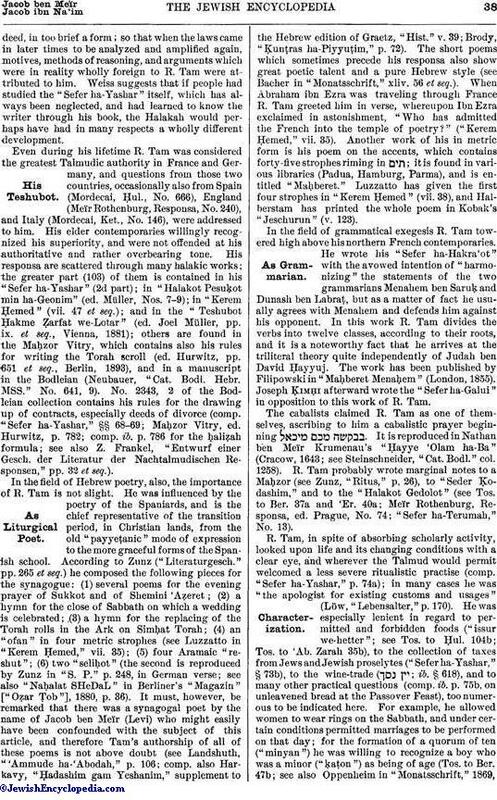 R. Tam's chief work is his "Sefer ha-Yashar," a very poor edition of which was published in Vienna in 1811, from a manuscript; the second part, according to an Epstein manuscript, with the notes of Ephraim Solomon Margoliouth and his own, was reissued by F. Rosenthal, among the publications of the Meḳiẓe Nirdamim Society (Berlin, 1898). The first part (§§ 1-582) contains principally R. Tam's explanations ("bi'urim") and novellæ ("ḥiddushim")—usually called "tosafot"—to thirty Talmudic treatises; the second part contains principally his responsa. 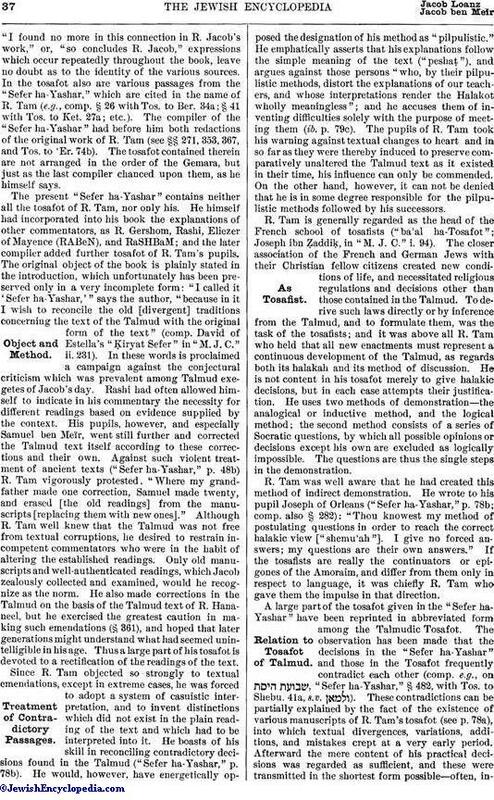 A very clear critical analysis of the "Sefer ha-Yashar" was made by I. H. Weiss in 1883; according to him the book in its present form was written by a pupil and relative of R. Tam, a grandson of R. Yom-Ṭob ben Judah. The original "Sefer ha-Yashar," written by R. Tam himself, and corresponding approximately to the first part of the present work, as the subscription at the end of § 540 shows, has doubtless been lost. 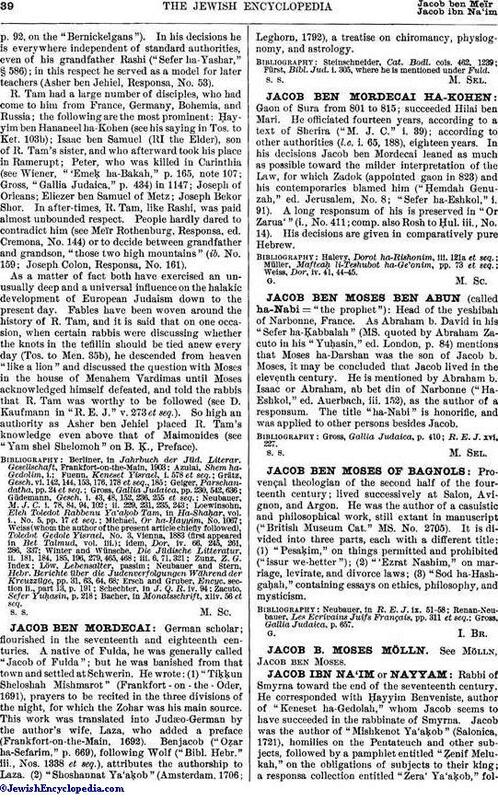 The compiler, however, worked with great literary precision and faithfulness, and such expressions as"I found no more in this connection in R. Jacob's work," or, "so concludes R. Jacob," expressions which occur repeatedly throughout the book, leave no doubt as to the identity of the various sources. In the tosafot also are various passages from the "Sefer ha-Yashar," which are cited in the name of R. Tam (e.g., comp. § 26 with Tos. to Ber. 34a; § 41 with Tos. to Ket. 27a; etc.). The compiler of the "Sefer ha-Yashar" had before him both redactions of the original work of R. Tam (see §§ 271, 353, 367, and Tos. to 'Er. 74b). The tosafot contained therein are not arranged in the order of the Gemara, but just as the last compiler chanced upon them, as he himself says. The present "Sefer ha-Yashar" contains neither all the tosafot of R. Tam, nor only his. He himself had incorporated into his book the explanations of other commentators, as R. Gershom, Rashi, Eliezer of Mayence (RABeN), and RaSHBaM; and the later compiler added further tosafot of R. Tam's pupils. The original object of the book is plainly stated in the introduction, which unfortunately has been preserved only in a very incomplete form: "I called it 'Sefer ha-Yashar,'" says the author, "because in it I wish to reconcile the old [divergent] traditions concerning the text of the Talmud with the original form of the text" (comp. David of Estella's "Ḳiryat Sefer" in "M. J. C." ii. 231). In these words is proclaimed a campaign against the conjectural criticism which was prevalent among Talmud exegetes of Jacob's day. Rashi had often allowed himself to indicate in his commentary the necessity for different readings based on evidence supplied by the context. His pupils, however, and especially Samuel ben Meïr, went still further and corrected the Talmud text itself according to these corrections and their own. Against such violent treatment of ancient texts ("Sefer ha-Yashar," p. 48b) R. Tam vigorously protested. "Where my grandfather made one correction, Samuel made twenty, and erased [the old readings] from the manuscripts [replacing them with new ones]." Although R. Tam well knew that the Talmud was not free from textual corruptions, he desired to restrain incompetent commentators who were in the habit of altering the established readings. Only old manuscripts and well-authenticated readings, which Jacob zealously collected and examined, would he recognize as the norm. He also made corrections in the Talmud on the basis of the Talmud text of R. Hananeel, but he exercised the greatest caution in making such emendations (§ 361), and hoped that later generations might understand what had seemed unintelligible in his age. Thus a large part of his tosafot is devoted to a rectification of the readings of the text. Since R. Tam objected so strongly to textual emendations, except in extreme cases, he was forced to adopt a system of casuistic interpretation, and to invent distinctions which did not exist in the plain reading of the text and which had to be interpreted into it. He boasts of his skill in reconciling contradictory decisions found in the Talmud ("Sefer ha-Yashar," p. 78b). He would, however, have energetically opposed the designation of his method as "pilpulistic." He emphatically asserts that his explanations follow the simple meaning of the text ("peshaṭ"), and argues against those persons "who, by their pilpulistic methods, distort the explanations of our teachers, and whose interpretations render the Halakot wholly meaningless"; and he accuses them of inventing difficulties solely with the purpose of meeting them (ib. p. 79c). The pupils of R. Tam took his warning against textual changes to heart, and in so far as they were thereby induced to preserve comparatively unaltered the Talmud text as it existed in their time, his influence can only be commended. On the other hand, however, it can not be denied that he is in some degree responsible for the pilpulistic methods followed by his successors. R. Tam is generally regarded as the head of the French school of tosafists ("ba'al ha-Tosafot"; Joseph ibn Ẓaddiḳ, in "M. J. C." i. 94). The closer association of the French and German Jews with their Christian fellow citizens created new conditions of life, and necessitated religious regulations and decisions other than those contained in the Talmud. To derive such laws directly or by inference from the Talmud, and to formulate them, was the task of the tosafists; and it was above all R. Tam who held that all new enactments must represent a continuous development of the Talmud, as regards both its halakah and its method of discussion. He is not content in his tosafot merely to give halakic decisions, but in each case attempts their justification. He uses two methods of demonstration—the analogical or inductive method, and the logical method; the second method consists of a series of Socratic questions, by which all possible opinions or decisions except his own are excluded as logically impossible. The questions are thus the single steps in the demonstration. R. Tam was well aware that he had created this method of indirect demonstration. He wrote to his pupil Joseph of Orleans ("Sefer ha-Yashar," p. 78b; comp. also § 282): "Thou knowest my method of postulating questions in order to reach the correct halakic view ["shemu'ah"]. I give no forced answers; my questions are their own answers." If the tosafists are really the continuators or epigones of the Amoraim, and differ from them only in respect to language, it was chiefly R. Tam who gave them the impulse in that direction. A large part of the tosafot given in the "Sefer ha-Yashar" have been reprinted in abbreviated form among the Talmudic Tosafot. The observation has been made that the decisions in the "Sefer ha-Yashar" and those in the Tosafot frequently contradict each other (comp. e.g., on , "Sefer ha-Yashar," § 482, with Tos. to Shebu. 41a, s.v. ). These contradictions can be partially explained by the fact of the existence of various manuscripts of R. Tam's tosafot (see p. 78a), into which textual divergences, variations, additions, and mistakes crept at a very early period. Afterward the mere content of his practical decisions was regarded as sufficient, and these were transmitted in the shortest form possible—often, indeed,in too brief a form; so that when the laws came in later times to be analyzed and amplified again, motives, methods of reasoning, and arguments which were in reality wholly foreign to R. Tam were attributed to him. Weiss suggests that if people had studied the "Sefer ha-Yashar" itself, which has always been neglected, and had learned to know the writer through his book, the Halakah would perhaps have had in many respects a wholly different development. Even during his lifetime R. Tam was considered the greatest Talmudic authority in France and Germany, and questions from those two countries, occasionally also from Spain (Mordecai, Ḥul., No. 666), England (Meïr Rothenburg, Responsa, No. 240), and Italy (Mordecai, Ket., No. 146), were addressed to him. His elder contemporaries willingly recognized his superiority, and were not offended at his authoritative and rather overbearing tone. His responsa are scattered through many halakic works; the greater part (103) of them is contained in his "Sefer ha-Yashar" (2d part); in "Halakot Pesuḳot min ha-Geonim" (ed. Müller, Nos. 7-9); in "Kerem Ḥemed" (vii. 47 et seq. ); and in the "Teshubot Ḥakme Ẓarfat we-Lotar" (ed. Joel Müller, pp. ix. et seq., Vienna, 1881); others are found in the Maḥzor Vitry, which contains also his rules for writing the Torah scroll (ed. Hurwitz, pp. 651 et seq., Berlin, 1893), and in a manuscript in the Bodleian (Neubauer, "Cat. Bodl. Hebr. MSS." No. 641, 9). No. 2343, 2 of the Bodleian collection contains his rules for the drawing up of contracts, especially deeds of divorce (comp. "Sefer ha-Yashar," §§ 68-69; Maḥzor Vitry, ed. Hurwitz, p. 782; comp. ib. p. 786 for the ḥaliẓah formula; see also Z. Frankel, "Entwurf einer Gesch. der Literatur der Nachtalmudischen Responsen," pp. 32 et seq.). In the field of Hebrew poetry, also, the importance of R. Tam is not slight. He was influenced by the poetry of the Spaniards, and is the chief representative of the transition period, in Christian lands, from the old "payyeṭanic" mode of expression to the more graceful forms of the Spanish school. According to Zunz ("Literaturgesch." pp. 265 et seq.) he composed the following pieces for the synagogue: (1) several poems for the evening prayer of Sukkot and of Shemini 'Aẓeret; (2) a hymn for the close of Sabbath on which a wedding is celebrated; (3) a hymn for the replacing of the Torah rolls in the Ark on Simḥat Torah; (4) an "ofan" in four metric strophes (see Luzzatto in "Kerem Ḥemed," vii. 35); (5) four Aramaic "reshut"; (6) two "seliḥot" (the second is reproduced by Zunz in "S. P." p. 248, in German verse; see also "Naḥalat SHeDaL" in Berliner's "Magazin" ["Oẓar Ṭob"], 1880, p. 36). 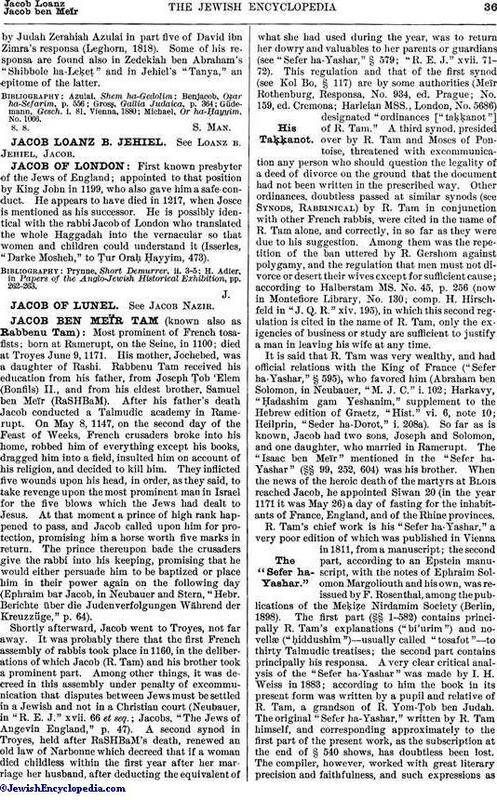 It must, however, be remarked that there was a synagogal poet by the name of Jacob ben Meïr (Levi) who might easily have been confounded with the subject of this article, and therefore Tam's authorship of all of these poems is not above doubt (see Landshuth, "'Ammude ha-'Abodah," p. 106; comp. also Harkavy, "Ḥadashim gam Yeshanim," supplement to the Hebrew edition of Graetz, "Hist." v. 39; Brody, "Ḳunṭras ha-Piyyuṭim," p. 72). The short poems which sometimes precede his responsa also show great poetic talent and a pure Hebrew style (see Bacher in "Monatsschrift," xliv. 56 et seq.). When Abraham ibn Ezra was traveling through France R. Tam greeted him in verse, whereupon Ibn Ezra exclaimed in astonishment, "Who has admitted the French into the temple of poetry?" ("Kerem Ḥemed," vii. 35). Another work of his in metric form is his poem on the accents, which contains forty-five strophes riming in ; it is found in various libraries (Padua, Hamburg, Parma), and is entitled "Maḥberet." Luzzatto has given the first four strophes in "Kerem Ḥemed" (vii. 38), and Halberstam has printed the whole poem in Kobak's "Jeschurun" (v. 123). In the field of grammatical exegesis R. Tam towered high above his northern French contemporaries. He wrote his "Sefer ha-Hakra'ot" with the avowed intention of "harmonizing" the statements of the two grammarians Menahem ben Saruḳ and Dunash ben Labraṭ, but as a matter of fact he usually agrees with Menahem and defends him against his opponent. In this work R. Tam divides the verbs into twelve classes, according to their roots, and it is a noteworthy fact that he arrives at the triliteral theory quite independently of Judah ben David Ḥayyuj. The work has been published by Filipowski in "Maḥberet Menaḥem" (London, 1855). Joseph Ḳimḥi afterward wrote the "Sefer ha-Galui" in opposition to this work of R. Tam. The cabalists claimed R. Tam as one of themselves, ascribing to him a cabalistic prayer beginning . It is reproduced in Nathan ben Meïr Krumenau's "Ḥayye 'Olam ha-Ba" (Cracow, 1643; see Steinschneider, "Cat. Bodl." col. 1258). R. Tam probably wrote marginal notes to a Maḥzor (see Zunz, "Ritus," p, 26), to "Seder Ḳodashim," and to the "Halakot Gedolot" (see Tos. to Ber. 37a and 'Er. 40a; Meïr Rothenburg, Responsa, ed. Prague, No. 74; "Sefer ha-Terumah," No. 13). R. Tam, in spite of absorbing scholarly activity, looked upon life and its changing conditions with a clear eye, and wherever the Talmud would permit welcomed a less severe ritualistic practise (comp. "Sefer ha-Yashar," p. 74a); in many cases he was "the apologist for existing customs and usages" (Löw, "Lebensalter," p. 170). He was especially lenient in regard to permitted and forbidden foods ("issur we-hetter"; see Tos. to Ḥul. 104b; Tos. to 'Ab. Zarah 35b), to the collection of taxes from Jews and Jewish proselytes ("Sefer ha-Yashar," § 73b), to the wine-trade ( ; ib. § 618), and to many other practical questions (comp. ib. p. 75b, on unleavened bread at the Passover Feast), too numerous to be indicated here. For example, he allowed women to wear rings on the Sabbath, and under certain conditions permitted marriages to be performed on that day; for the formation of a quorum of ten ("minyan") he was willing to recognize a boy who was a minor ("ḳaṭon") as being of age (Tos. to Ber. 47b; see also Oppenheim in "Monatsschrift," 1869,p. 92, on the "Bernickelgans"). In his decisions he is everywhere independent of standard authorities, even of his grandfather Rashi ("Sefer ha-Yashar," § 586); in this respect he served as a model for later teachers (Asher ben Jehiel, Responsa, No. 53). R. Tam had a large number of disciples, who had come to him from France, Germany, Bohemia, and Russia; the following are the most prominent: Ḥayyim ben Hananeel ha-Kohen (see his saying in Tos. to Ket. 103b); Isaac ben Samuel (RI the Elder), son of R. Tam's sister, and who afterward took his place in Ramerupt; Peter, who was killed in Carinthia (see Wiener, "'Emeḳ ha-Bakah," p. 165, note 107; Gross, "Gallia Judaica," p. 434) in 1147; Joseph of Orleans; Eliezer ben Samuel of Metz; Joseph Bekor Shor. In after-times, R. Tam, like Rashi, was paid almost unbounded respect. People hardly dared to contradict him (see Meïr Rothenburg, Responsa, ed. Cremona, No. 144) or to decide between grandfather and grandson, "those two high mountains" (ib. No. 159; Joseph Colon, Responsa, No. 161). As a matter of fact both have exercised an unusually deep and a universal influence on the halakic development of European Judaism down to the present day. Fables have been woven around the history of R. Tam, and it is said that on one occasion, when certain rabbis were discussing whether the knots in the tefillin should be tied anew every day (Tos. to Men. 35b), he descended from heaven "like a lion" and discussed the question with Moses in the house of Menahem Vardimas until Moses acknowledged himself defeated, and told the rabbis that R. Tam was worthy to be followed (see D. Kaufmann in "R. E. J." v. 273 et seq.). So high an authority as Asher ben Jehiel placed R. Tam's knowledge even above that of Maimonides (see "Yam shel Shelomoh" on B. Ḳ., Preface). Bacher, in Monatsschrift, xliv. 56 et seq.